My Chemical Romance in Montreal or Quebec City? Inform me about the next events for My Chemical Romance. Enroll yourself to our priority waiting list for My Chemical Romance to be alerted when new tickets are available. Filling this form doesn't engage you to any purchase. My Chemical Romance and Blink 182 will be sharing the stage of the Bell Centre, in Montreal on August 16th, 2011. Manchester Orchestra will also be performing on that night. This will be a second show in less than 6 months in Montreal for My Chemical Romance, who performed at the Metropolis in April. 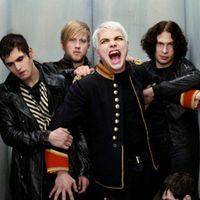 My Chemical Romance are still promoting its latest record Danger Days: The True Lives of the Fabulous Killjoys, which they released in November 2010.